I have 4′ x 4′ raised beds in my veggie garden, and no matter what I do, my squash plants always outgrow them and run all over the gravel paths in between the beds. I’ve even planted one right smack in the middle of a bed, and it still outgrew it and ran all over the place. It makes it very difficult to walk around the beds without getting scratched up by squash leaves and stems (those suckers are MEAN) and do the watering (I don’t have a watering system in the beds, so I have to do the hose dragging thing) breaking off leaves, stems and squash in the process. 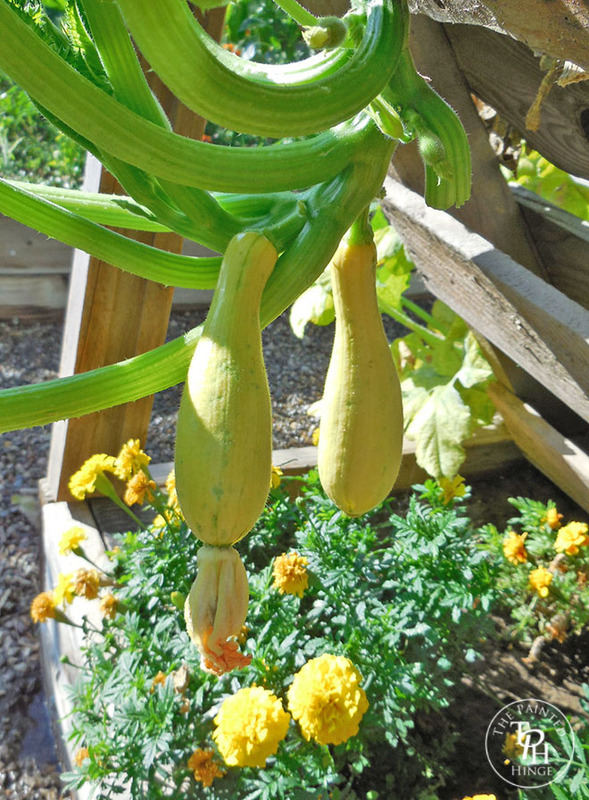 I thought about just doing a trellis, but squash plants typically aren’t big climbers, and their stems and leaves are big and heavy and will break off if you look cross-eyed at them. Not good candidates to attempt tying and/or stringing onto a trellis! But, I thought maybe they could handle climbing up a gentle grade on some sort of rack. 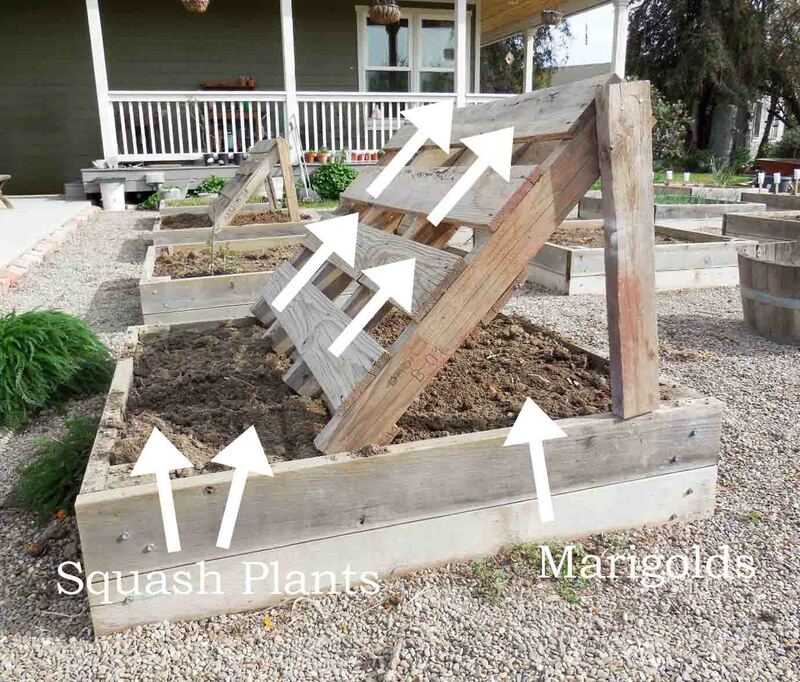 The materials and directions below are for one squash growing rack that will fit a 4′ x 4′ raised garden bed, but these can be made to any size you want and do not have to only be used in a raised garden bed. They can be used anywhere in your garden where you want to save precious gardening space and keep your squash plants from taking over. 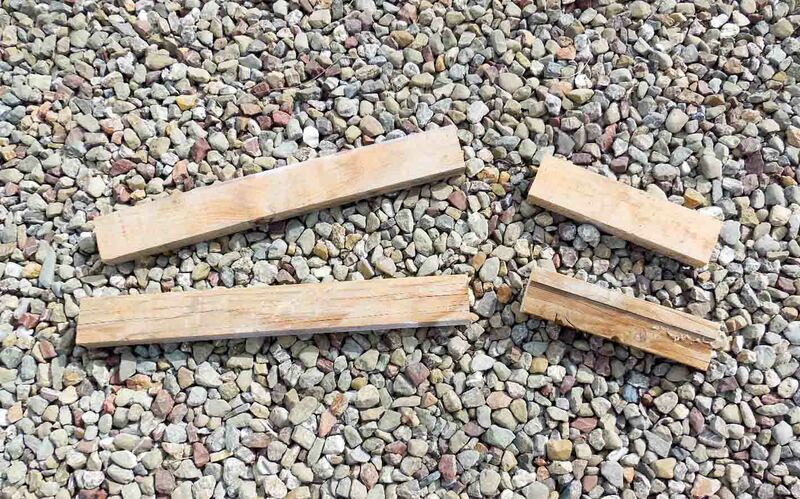 Start by figuring out the angle of the finished rack so when it is placed in the raised bed, it will cover 2/3 to 3/4 of the south end of the bed. The idea here is to plant the squash on the north end of the bed, and as they grow they will climb up the side of the rack following the sun in the south. 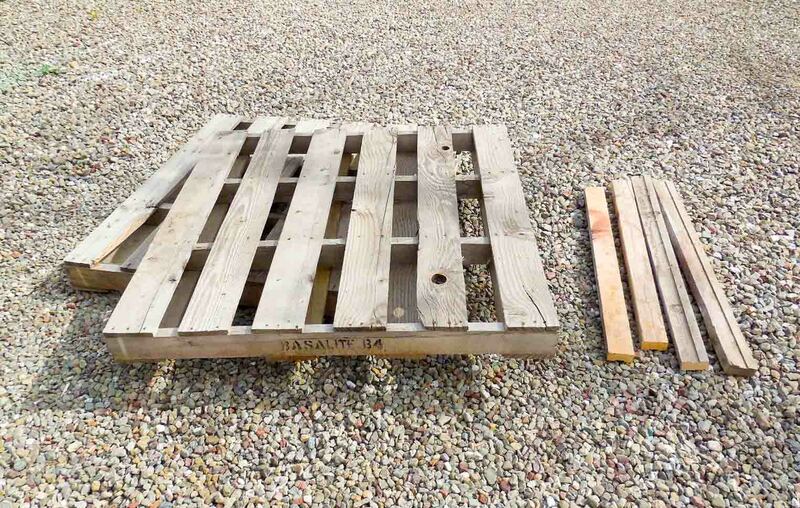 I cut my pallets to 3′ and 2 x 4’s to 2′, which gives the rack approximately 45 degree angle. 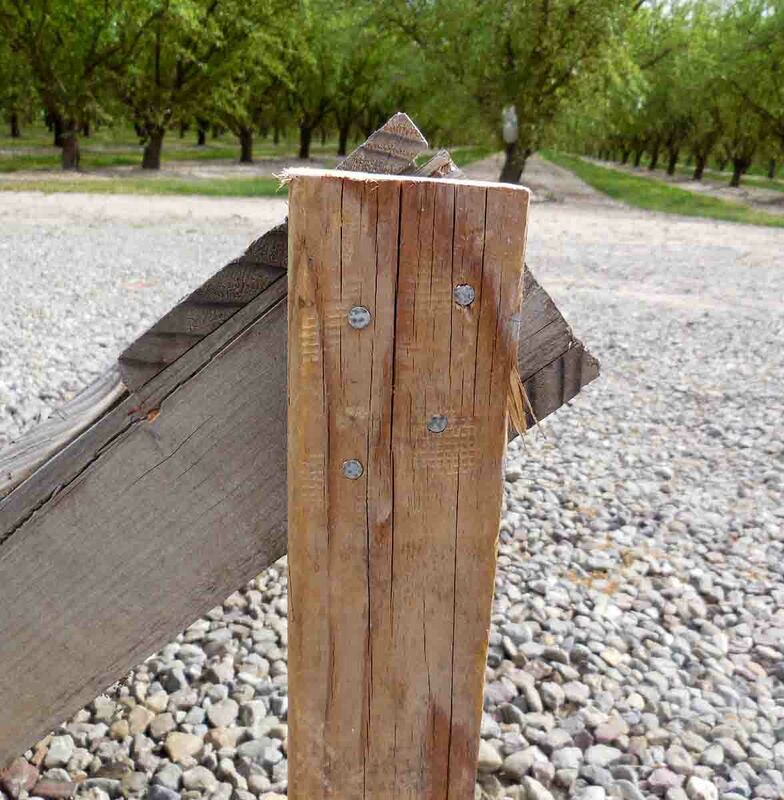 Nail the 2 x 4’s at each end of the pallet to make a rack. Now you’re in business. 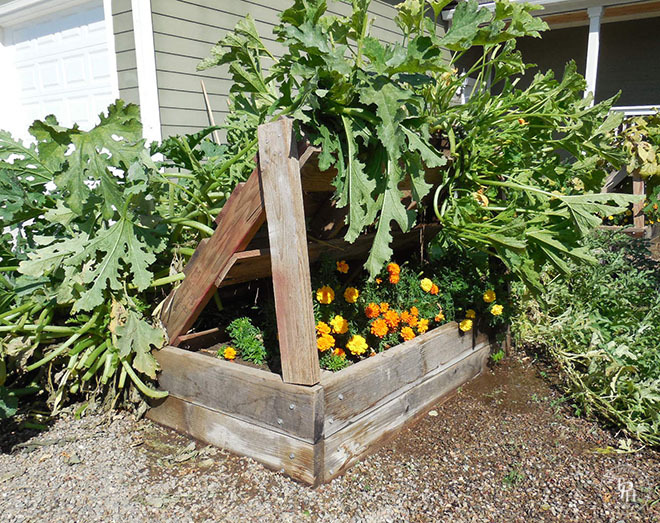 Place your squash rack in your garden and get planting! I planted the squash on the left to the north so they would follow the sun in the south up the pallet instead of running all over the garden paths. 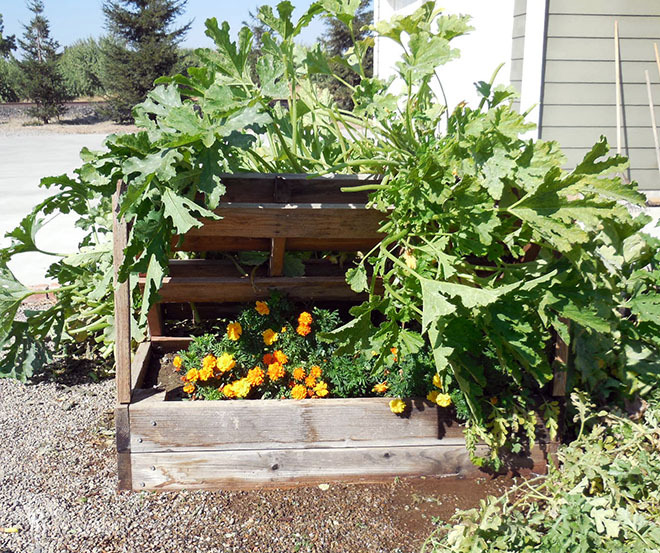 I planted the marigolds on the south side underneath the pallet to help deter aphids and other pesky bugs who like to ruin squash. The results were much better than what I expected! This almost worked TOO well!!! 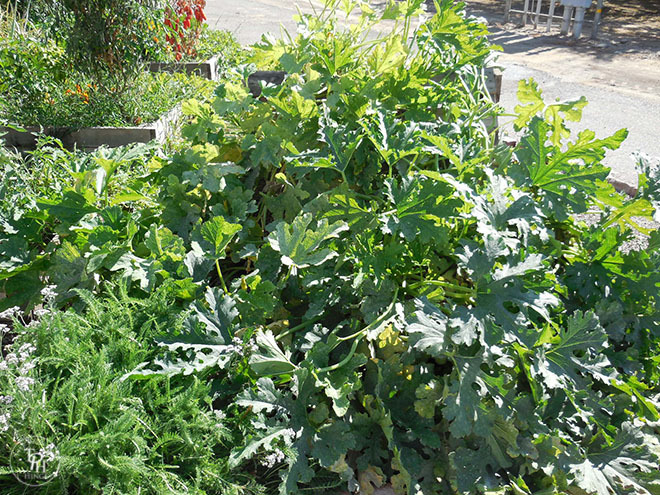 I planted two plants per 4′ x 4′ bed, and they just grew like mad and produced like crazy!!! I was constantly pruning them back because the plants were crowding each other out! I’ve never had squash plants get this big! Next year I will only need to plant one squash plant per bed because when I planted them this way, I got twice the amount of squash per plant than what I usually do! And there was NO aphids at ALL on the squash plants I planted this way! And I know we had aphids around because my melon plants that were not set up this way did have aphids on them this year. Planting the marigolds where they grew under the squash plants really did the trick!!! I hope you found this post helpful and will save you from a summer of tripping over your squash plants! Please let me know what you think and if you have any questions! 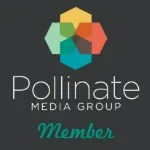 I just found your blog via Surroundings By Debi and have enjoyed looking around your site. I am pinning this idea to try next spring, because our butternut squash plants are taking over our garden for the second year in a row, and I am desperate to find a better way to grow them. Like you, I do the “drag the hose thing” when watering. 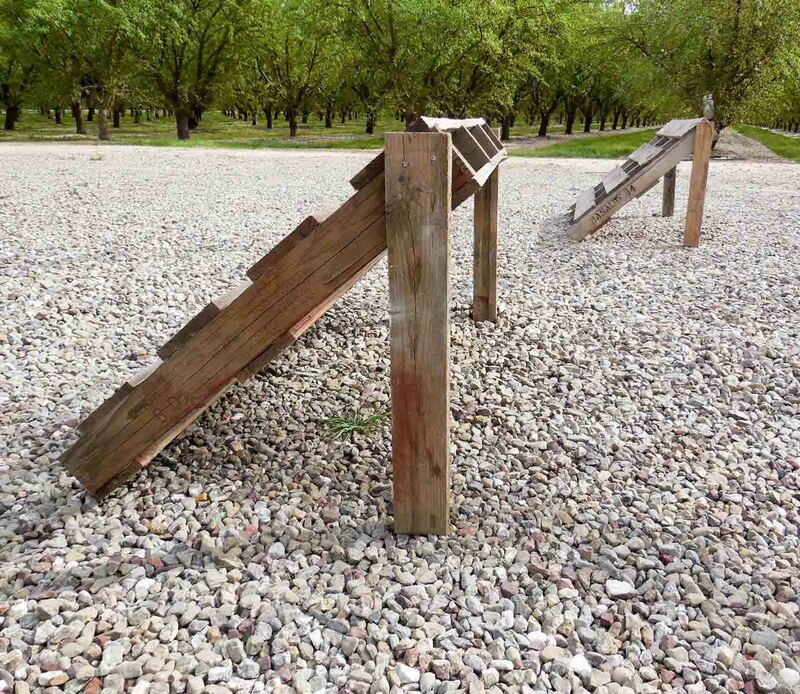 That can be a challenge in itself because of how large our garden is and where it is located….add in gigantic squash plants taking over the paths, and it becomes a real chore. My gardening time is supposed to be my quiet serene time, so I don’t need silly little frustrating things like mean scratchy squash plants ruining that. Thanks for sharing the idea! Hi Michelle, I had exactly the same idea yesterday then came across at your fantastic blog, I’m away to pick some pallets up tomorrow. Gives me something to do during these long cold dark winter months. Just wondering if they can be used for anything else i.e Beans. Hi Mal! Well you know what they say- great minds think alike 🙂 I don’t think these would work well for beans because beans really like to climb vertically and get quite tall, so I think they would outgrow this pallet rack pretty quickly. 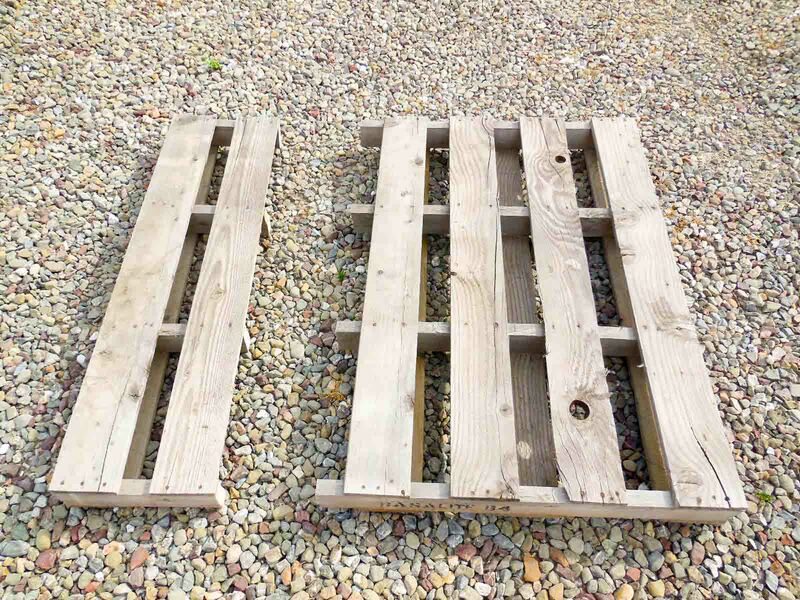 However, these pallet racks should work well for about any kind of squash plants. Hi again Michelle, I’m in the process of making MK2 beds. My beds are 6ft wide & have just managed to source some pallets which are 6ft 6″ so that is my task over then next couple of days, I’ve currently got 1 and a half pallets in situ so taking them down & replacing them with the longer ones should be no problem. Plus, they’ll look a lot better. Thanks again for the idea.